Leonard Chant was the husband of Minnie J Chant of Elm Cottage, Upper Howsell, Malvern Link. He enlisted in the Worcestershire Regiment in November 1914 and left nine children. After the war his wife moved to Manchester, where she set up home at Malvernia, Bury Old Road, Whitefield. His Daughter Edith Caroline Chant came to Australia in 1927 where she met and married Claude Frederick Melbourne (known as Fred). 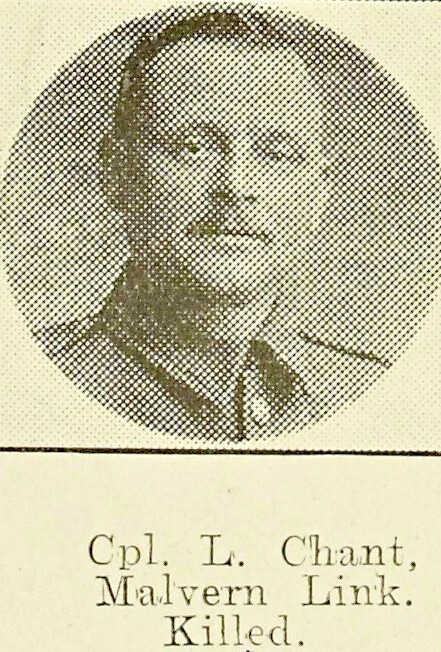 His brother also died in the war – Herbert Chant of Highley (formerly Malvern Link).